June is coming to an end so what’s around the corner? You know what. The Fourth of July, Independence Day, our nation’s birthday, etc. You’re going to have the day off but have you even made any plans yet? You want to do something to celebrate the day but what? Local barbecue: This one’s obvious, I know, but it’s always a fun time. Between the burgers, the hot dogs, the fish, I could go on forever! And hey, if those aren’t your thing because you prefer your greens, there are plenty of ways to cook veggies. You don’t know how good a veggie kabob tastes until it’s cooked on the grill. So, invite your friends, family, and your neighbors (if you know them like that) and make sure one of them brings the potato salad. 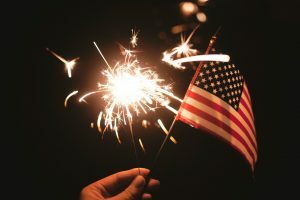 Fireworks: You may want to have your own private fireworks show but before you even think about it, make sure to look up your state’s laws regarding this.If you find out that you can’t legally do your own fireworks, then don’t; they’re not so much fun that you should risk getting arrested. Instead, check online for an awesome public firework show, grab a blanket, arrive early to get a spot with the best view, and watch the rockets’ red glare. Learn Some History: So you don’t live near the Boston Harbor or the Liberty Bell. But America is littered with impressive historical landmarks, if you know where to look. After all, your state didn’t become one of the 50 by accident. So, go on a history excursion. Visit a local historical museum, look up and show up at national landmarks, or find some history buffs who really want to share their knowledge. Support a Vet: It’s not Memorial Day or Veterans Day but if it wasn’t for those American soldiers long ago, you wouldn’t be able to enjoy a relaxing day filled with barbecues and fireworks. So, find a way to support any active or retired servicemen and women. Short on ideas? Check out this blog post. Stay Inside: Temperatures can sometimes rise to levels that can be unsafe for some of us. If you or some of your hang-out buds are prone to dehydration, heat stroke, or feeling faint during especially hot days, then don’t feel compelled to brave the sun. Instead, stay inside and have a movie marathon with the family. You can rent Zootopia on Amazon Video for $5.99 as of June 21, 2016. Make sure to stay hydrated and just relax. Also, don’t forget to grab a flag that you can wave proudly during these events. You can purchase a best-selling embroidered 100% American-made American flag on Amazon for $28.62 as of June 21, 2016. So, whether you’re barbecuing with friends or watching the sky light up on TV, just take some time and appreciate the things you can do in the Land of the the Free and the Home of the Brave. This entry was updated on Friday, July 1st, 2016 at 2:48 pm. This entry was originally posted on Monday, June 27th, 2016 at 5:00 am	and is filed under Holiday. You can follow any responses to this entry through the RSS 2.0 feed. You can skip to the end and leave a response. Pinging is currently not allowed.